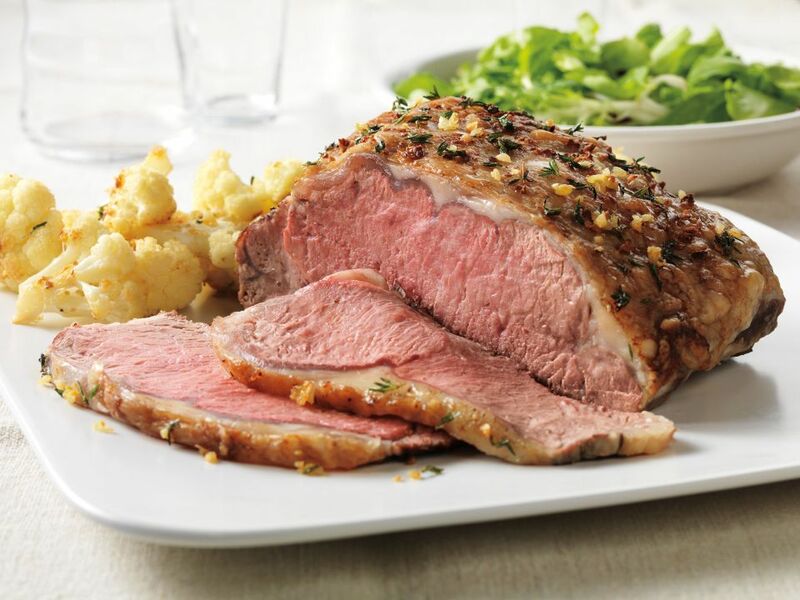 In this flavorful dish, Top loin roast, which is considered a lean cut, gets a rub-down using a simple mixture of garlic and thyme. Serve with roasted cauliflower for a potato-free version of a meat and potatoes meal. This is a nice choice for a holiday dinner with family and friends. Press 2 teaspoons of garlic evenly onto all surfaces of beef roast. Press thyme evenly over roast. Place roast, fat-side up, on rack in shallow roasting pan. Insert ovenproof meat thermometer so tip is centered in thickest part of beef, not resting in fat. Do not add water or cover. Roast on center rack in 325F oven 1-1/4 to 1-1/2 hours for medium rare; 1-1/2 to 1-3/4 hours for medium doneness. Meanwhile, toss remaining 2 teaspoons garlic, 4 tablespoons oil and cauliflower on rimmed baking sheet. Cover with aluminum foil; bake on lower rack 45 minutes. Combine bread crumbs and remaining 2 tablespoons oil. Remove foil; sprinkle bread crumbs evenly over cauliflower. Continue to bake, uncovered, 30 to 45 minutes or until crumbs are golden brown and cauliflower begins to brown. Remove roast when meat thermometer registers 135F for medium rare; 145F for medium. Carve roast into slices; season with salt and pepper, as desired. Serve with cauliflower.